It's no secret that kitchens are our favorite room to design. They set the tone for the entire home and we always start with them. This kitchen was just dated! It looked like a tract home from decades ago, because it was! Don't forget to catch the webisode when you're done! Catch up with the rest of the Calabasas Remodel by checking out the Great Room, Master Suite, Kids' Rooms, and Family Room! We carried the wood floor from the rest of the home into the kitchen. Our clients requested navy throughout the home. We used it in the Master Suite and Great Room and for the kitchen they wanted it on the island. We were more than happy to oblige! This paint color is Blue Note by Benjamin Moore. We framed the hood with two huge pendants. We brought the range hood all the way up to the ceiling and straightened it out to fill the space. Subway tile always looks good in a coastal kitchen, but we wanted to mix things up a bit. To do this, we took a glossy white subway tile and used it in a herringbone pattern all the way to the ceiling for a dramatic effect, and then carried it throughout the whole kitchen. One of the major changes in this space's layout was the plumbing. We switched out the old faucet for a beautiful new one, with a beautiful arch. We also added a pot filler below the range, which is a beautiful and luxurious feature for your kitchen. We used matte brass hardware throughout the cabinetry to contrast with the polished nickel faucet. Bringing the cabinetry up to the ceiling makes the kitchen feel more grande, and creates one less spot for dust to collect. We had a long section of open space on the side of the kitchen, so we decided to create a desk space. When you have a growing family, you never want to sacrifice an opportunity for functionality in a space! A sconce over the window helps to designate this window as a workspace. You can see the laundry room from the kitchen, so we wanted to make sure it was a pretty sight. 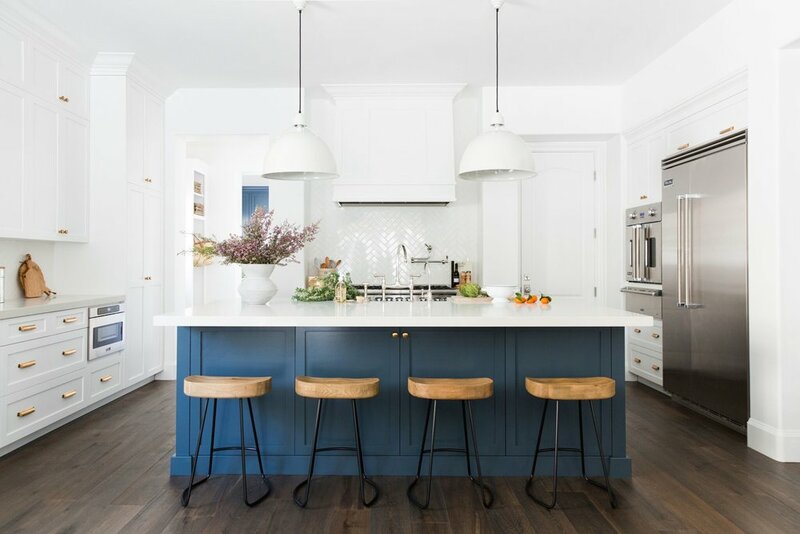 We carried the blue paint (Blue Note by Benjamin Moore) into the space, which brings the spaces together and happens to pair perfectly with the tiled flooring. We also played off the industrial style in the kitchen pendants by using an industrial caged light fixture. We always say this, but a space that requires a task as tedious as laundry deserves to be beautiful!